Protecting our valuable RV electronic and electrical components from power fluctuations is important. Otherwise, they will be damaged due to faulty park power. When that happens, we’ll lose much money from the investments we have made for those appliances, including air conditioner, microwave oven, television, humidifier and so many more. For this reason, we need to find the best RV surge protector. But with plenty of options on the market, you might find it hard and confusing to select the right one that you can depend on all the time when it comes to protecting your rig from open neutral, open ground and reverse polarity. For this reason, we have come up with the following guide highlighting the top picks on the market as well as a buying guide that outlines certain things to consider when buying a surge guard for the recreational vehicle, camper or pop-up. Are you looking for the best 30 amp RV surge protector? The long search can be over by taking a second look at the Progressive Industries 30A model here. It is a smart surge protector that can protect your RV appliances and equipment from faulty park electricity and sudden surges of power that can damage them. By far, it is one of the best surge protectors on the market just by checking out its performance features and functions. You should not miss it if you’re looking to get the most value out of your investment. After all, a surge protector isn’t a cheap investment anyway. You can rely on its performance and reliability to protect your recreational vehicle at all times because this model is also built with a polarity tester that you can count on all the time. The model also comes with an indicator that clearly displays and provides details about its current condition. It is one of the smartest features of this device that won’t let you down. Another thing I liked about the protector is that it is portable and compact inn design, few of the characteristics to look for when shopping around for this product. I love that the maker has put consumers in mind when it comes to offering durable RV products designed to promote ease of use and easy portability. You will also find it very useful for its open ground, open neutral and reverse polarity detection of surges. What do these mean? It only means that we can easily spot for anything wrong within a few seconds of plugging the protector. I also liked that it has a polarity tester, allowing us to check the status of the power source before we use it for safety. On the negative, the dimensions are quite bulky. Just as how reliable is a Progressive Industries Ems-Pt50x, the Surge Guard surge protector is another top choice when looking for a valuable and durable protector that we can always count on to protect our RVs from faulty electrical source. 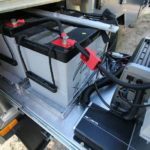 It is one not to forget on this list because of its efficiency in checking and detecting any electrical surges and inconsistent power supply from RV parks and campsites. The Surge Guard 44260 can protect our RV appliances and electronics from damage because it can spot for any inconsistent power supply in an instant that would otherwise lead to serious problems, such as the breaking down of our electronics and damage to our appliances. Another standout feature of the surge protector is its 6500A max spike current, allowing it to detect any power supply fault fast and instantly. One of its features that I liked is its 2,100 joules suppression rating, meeting high standards in fully protecting our devices and appliances against any power surges. Of course, we’re also going to use the protector outdoors, and that’s great about the 44260 because it is weather-resistant. It won’t fail working no matter the weather condition. That also counts when it comes to the durability of the model. The surge protector also comes with a lock hasp, which keeps it safe and secured once installed in our vehicle. And if we want to check on the power status, the smart RV device also has these light indicators that instantly informs us about it. Definitely, having it on our rig is one of the best decisions we can make in terms of ensuring our recreational vehicle will always be protected from damage due to faulty power. On a drawback, this one is heavier than others on the market are. 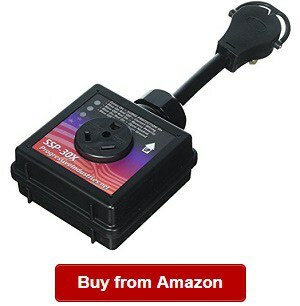 If you’re shopping around for a reliable and top performing RV surge protector in the category of the best 50 amp RV surge protector, you might want to take a look at the SSP 50XL. It is a well-built and intelligently designed protector meant for our camper, travel trailer or RV. For one, it is from Progressive Industries, one of the leading makers of top quality and durable protectors on the market known in the caravanning and RVing world through the years. I liked the well thought of design, allowing us to use it easily without any hassles. Each design element must be there, and Progressive Industries has considered them well. It is also built with an instant polarity detection, open ground and open neutral immediately, allowing us to spot for problems within the first few seconds of plugging it. With it, you can prevent possible damage to your appliances and electronics. I also noticed that it has an indicator light, which can instantly warn us of an incorrect wiring coming from a power source. So with given warnings early on, we can prevent any issues from arising especially in the event of a surge failure. Without even saying, the SSP 50XL can offer us total peace of mind when it comes to the full protection that can it can provide our rig with all the time. It also has a sturdy pull handle that lets us plug it into a shore power right away. On a drawback, it has a lower surge suppression rating of only 1650 joules than other models on the market have. This Technology Research surge protector is one of those that will come up on top of searches. There is no wonder. It is one reliable model that delivers its promise of providing full protection to our rig against power failures and surges. It is a 50 Amp model; that I should include in these reviews for its top performance that you can always count on when looking for a good entry level and portable surge protector that delivers correct results. The 44270 is also one of the most portable units to find on the market. With this feature, you can be certain that you won’t have any problem using it conveniently when needed. The overall design is also well thought of, allowing for quick and easy operation. Even those without experience in using such device will find it easy to operate and get used to. With the Technology Research surge protector, you can have peace of mind that it can detect faulty power supply in the RV Park or camping ground. Such an intelligent feature also gives us confidence that we’re connecting to a secure power source to prevent damage to our RV appliances. By far, it is also one of the strongest when it comes to surge protection rating, boasting 4200 joules. Definitely, it is a powerful contender when shopping around for the right surge protector for our rig. I also appreciate that the model can provide full RV protection during open ground and open neutral cases. I also liked that it can handle all types of weather conditions, making it suitable for all-year-round season use. You can rely on it for its ability of handling harsh conditions, including wind, snow, rain and sun. You can also count on it when it comes to correcting polarity right away. On a negative note, the light isn’t that powerful and durable. The 34830 is another product not to miss when looking for a good portable RV surge protector that can provide your rig with protection against power surges and faulty connections. It is a reliable product that comes big time when it comes to performance and functions. When camping with your recreational vehicle, travel trailer or camper, you can rely on this product when it comes to protecting your vehicle and its electronics, equipment and appliances from damage. Some of these include the microwave oven, TV, air conditioner and oven toaster. If you would select the Surge Guard 34830, you can have peace of mind that your precious investments won’t be damaged due to faulty park power, which is a common problem across RV parks and campgrounds. This portable model is also easy to maneuver and carry around. Thanks to its ease of use element in the design that the manufacturer did not forget in designing and building the Surge Guard 34830. This portable RV surge protector is also built with intelligent features, promoting ease of use and operation all the time. Even first time users won’t have a hard time in operating it. This model also has a strong display, which instantly shows information so that you can easily check if there are issues. The product also has an automatic reset feature that instantly works on power restoration. On a negative note, the RV surge protector display light isn’t that durable. The Progressive EMS-PT30X is another top contender when it comes to the best performing and intelligent portable surge protectors on the market. 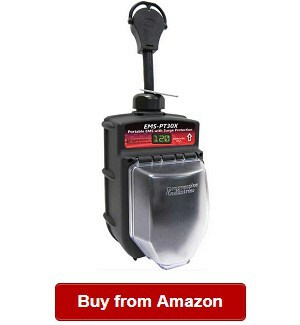 Again, this product from Progressive Industries, one of the most trusted brands of RV surge protectors known in the RV camping world through the years. 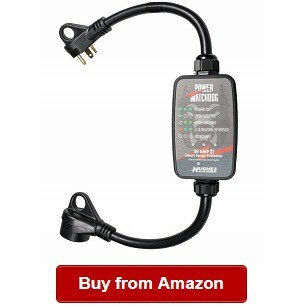 It is a top of the line product that ensures total protection of our recreational vehicle from faulty park power source. 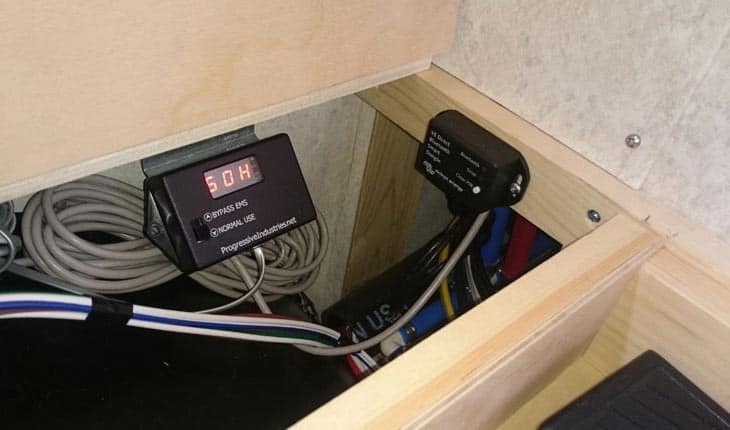 With that said, you can have peace of mind that those appliances, equipment and devices on your RV relying on power will not be damaged due to faulty connections and power pedestal. When it comes to ease of operation, this one is the winner. I cannot ask for more in its intelligent design that makes it a smart product for the serious RVer that wants to protect his rig from damage brought about by improper power supply, failure and surges. I believe that the most of us in the camping world would also want to use a surge protector that is designed and built with components that can withstand weather elements and changes. No matter what kind of weather, including rain, snow, wind and sun, it will be exposed to, it will be able to keep up. It has a weather shield that makes it a strong and durable unit that can last longer than other models on the market can. You will also find its locking bracket useful that it can keep the product in place. It is easy to plug to the power source. I also noticed that it has a tough pull handle for easy maneuvering. It also has this Lexan housing, which makes it tougher. It can also provide full protection to the RV for its surge suppression rating of 1790 joules. On a negative note, the product is expensive. Even so, I think all its performance features overpower the one-time cost to spend. When trying to weigh the RV surge protector pros and cons, you can easily see that this model stands out the competition because its pros outweigh any cons. The Surge Guard 34850 is one of the most powerful portable models on the market. 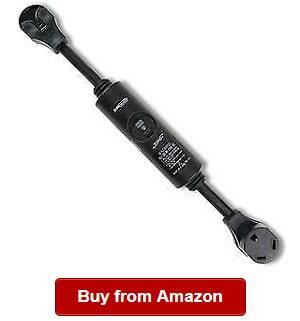 I would like to recommend it as one reliable unit that you could ever get for your recreational vehicle. The 34850 Surge Guard offers twice the joules that other previous models could provide, meaning more powerful and complete surge protection ability. You can also appreciate that it can help in monitoring reverse polarity, voltage and amp instantly and consistently. I also liked that this model can offer AC compressor protection. As you know, it is one of the costliest to spend on for the comfort of our loved ones in our RV, and that is because of the 128-second reset delay that it is designed and built with. This model is also offering up to 3,850 joules of protection from surges, offering full protection to our rig from any faulty electrical connection and power supply. When it comes to compatibility, this one is versatile that you can use it for recreational vehicles, travel trailers and motorhomes that make use of 50A service. This unit also comes with an automatic reset feature that allows it to work right away during plug disconnection and power restoration. In addition, the unit works best in providing full protection to our RV because it can also work to shut off the power in the event of an open ground and overheating. It also has an LCD display for easy reading of what you need to know. The Technology Research 34850 Surge Guard is a decent product that you can count on for your recreational vehicle. On a drawback, this model does not include a surge failure indicator. When shopping around for a reliable surge protector for your recreational vehicle, you should not miss the Progressive Industries HW50C on your list. It is one of the most reliable products around for its performance and efficiency in offering you with full RV protection from surges due to faulty power shore and failures. It is by one of the most reliable brands for the RV community, too, Progressive Industries. Through the years, it has been known to be a great maker of quality surge protectors, which also last long and perform well under tough conditions and weather changes. One of their best offerings is the HW50C that is by far also one of the most powerful surge protectors around that never fail to impress RV owners worldwide. It can provide complete RV protection so that you can have peace of mind that your precious RV electronics and appliances won’t be damage when there are power surges. You can rely on it for all potential power conditions. I also appreciate that it has very compact and simpler design that allows for easy operation and convenient use. The HW50C also has plug-and-play replacement parts, so you can have peace of mind that you can have it repaired quickly and easily when there are problems. I also would like to recommend this model because of its digital display, showing us the vital information we need to ensure that the device is working properly. It can also notify us of any potential issues right within the first few seconds of plugging it in. This display lets you easily access voltage, present error code, previous error code, frequency, and so many more. Another thing I appreciate about the RV surge protector is its multiple mode surge protection. It can efficiently protect the RV, including open neutral, lost neutral, reverse polarity and voltage protection. That said you could rest assured that your rig is safe and secured from all potential power problems that would otherwise lead to costly repairs or damage to your appliances, such as air conditioning and television. I also liked that it has a time delay feature, which is valuable for your AC compressor, protecting the AC from any potential damage from accidental 220V. The product is also UL certified for quality. It also comes with a lifetime warranty that gives you peace of mind. Finally, it is also Canadian approved. On a negative note, this product is costly. However, the price is outweighed by the plenty of benefits that it offers owners. It is definitely worth the investment. If your recreational vehicle or camper is a 30AMP service, you might want to select the Surge Guard 44280. It is one reliable product that can last for years for its durable and solid components. The brand is also one of the most known when it comes to providing high quality surge guards for travel trailers, mobile homes and recreational vehicle through the years. If you’re looking to get the most out of your investment, you should not think twice but take a look at the Surge Guard 44280. The 120V 30A model is also one of the most powerful around because it is designed and built to manage and handle the high power demand and consumption in recreational vehicles. To guarantee its quality, the model is also UL listed. It is a safe and quality surge guard that can provide complete protection to your recreational vehicle all the time, giving you peace of mind that a faulty park power won’t damage your appliances because this one can constantly check and monitor the power supply to ensure that your precious investments won’t break down or damaged. The model is also efficient and reliable when it comes to identifying power supply status in an RV park or camping ground. 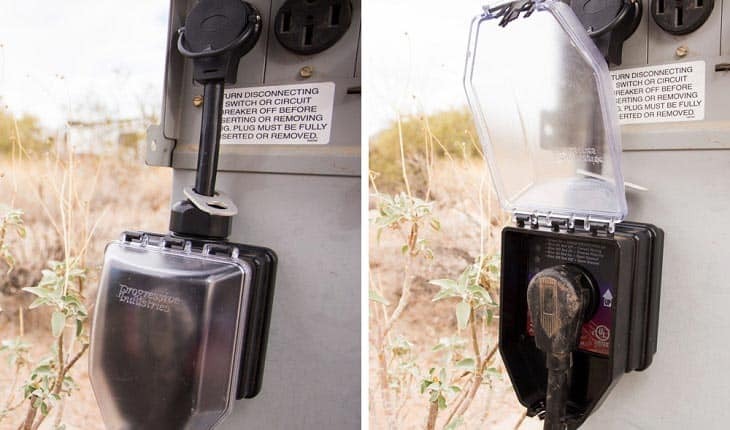 It is one of the best when it comes to this feature, so you can always sleep well at night and enjoy your camping experience knowing that your rig is protected from power surges and faulty connections. This model can effectively analyze circuits to help you learn about the status of the power supply. The Surge Guard 44280 can also provide multiple surge protection, including reversed ground, polarity or lines, open neutral, open ground and correct polarity. It is one of the most reliable around when it comes to checking for these multiple important areas. You can also count on the Surge Guard 44280 because it is portable and compact. I also liked that it comes with a rainproof and weather resistant cover, ensuring that its components won’t degrade due to changing weather conditions. In short, you can count on it when it comes to maximizing your investment on the RV equipment. However, it is a bit hard to install on the RV for its larger than usual dimensions. Another product that I proudly recommend on the list is the Progressive Industries 313.1163 SSP-30XL. When it comes to recreational vehicles with 30amp service, it is one of the most trusted products to choose from and install. With it, you can rest assured that your rig is protected from multiple types of power surges coming from a faulty power shore. It is also reliable for its top performance and heavy-duty components well chosen and included to ensure of long-lasting service of the surge guard. If you’re shopping around for a good surge protector, you might want to include the product that offers reliability and full protection to your camper or rig. The SSP-30XL is also UL listed, meaning it passed safety and quality standards set by the authorities in identifying the best RV supplies and equipment for smooth operation. I also liked that the model is designed and built to deal with the harsh outdoor conditions, meaning it is to last even with adverse weather and outdoor conditions. It is one of the best features to look for when shopping around for this product to ensure of long lasting use and reliability that it won’t fail with continued use. Another thing that ensures it is heavy-duty is its weatherproof assembly and materials. It is also built with thermal protection to protect it from overheating. Those are only some of the features that make the model even more durable than the rest on the market are. You will also appreciate that it is also easy to set up, eliminating the hassle associated with the complex installation process coming with other products in the same category are. This model comes with easy to follow instruction manual complete with photos or diagram that makes it very quick to install and use within minutes. Another remarkable thing about the Progressive Industries product is that it has multiple surge protection functions, including reverse polarity, open ground and open neutral. 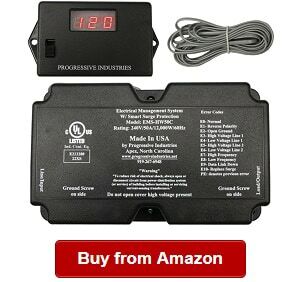 You can have peace of mind that your RV will be fully protected from faulty RV park power source because this product works hard to monitor any potential problems right away and indicate those through the display. You will also appreciate that the surge guard is compact and solid, making it easy and quick to maneuver and move around. It also has an easy pull and durable handle plus a locking bracket that makes it secured in place. I also appreciate the LED indicators informing us immediately what we need to know to prevent any potential problems. With the alerts and notifications, the surge protector becomes more reliable to use. On a drawback, the product comes with not so bright display that needs improvement. The 44750surge guard is one of the most durable products in the same category. The model continues to impress users for its reliability and top performance. It can last for years and provide you with the best value for your investment. The surge protector is also from one of the most trusted brands around when it comes to surge guards because of its high innovation and commitment. They offer only the best products for RV owners looking to get a product that can work efficiently and correctly in providing their rigs with full protection from reverse polarity, open ground and open neutral. When there are ground faults, it would be dangerous for our rig if we don’t have a surge guard like the 44750. It has the ability of shutting off the power automatically when it detects any ground faults. That is a smart feature that should be one of the most important factors to consider when buying a surge guard for the RV or camper. The Technology Research 44750 is ideal for recreational vehicles, pop-ups and campers. It is built to withstand changing weather conditions and adverse outdoor elements. It is guaranteed to last long, providing you with RV protection to prevent damage to your appliances, devices and electronics. 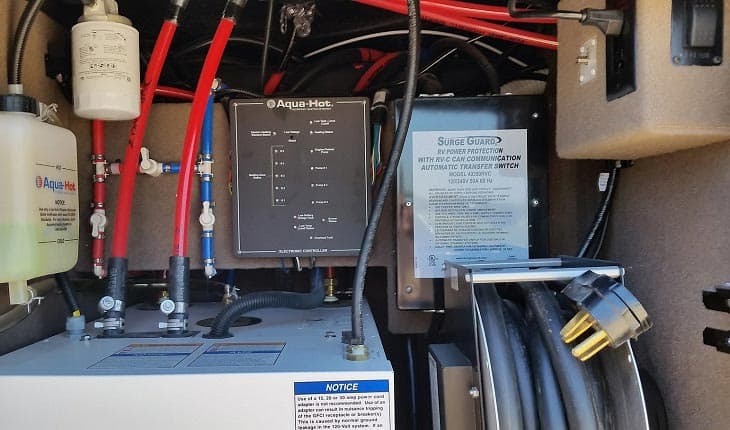 You might want to take a look at it if you’re looking for a dependable surge guard that defend your RV from faulty connections, failures and surges in RV parks and campsites. There are also handles included in the unit, so you can use it conveniently and without any hassles. I also liked that it has 510 joule surge suppression rating, which can be enough in handling many applications. It is also weather-resistant that it can deal with snow, rain, sun and wind, adding to its performance and durability. So if you’re looking for an all-season surge protector, you should not miss the Technology Research 44750. 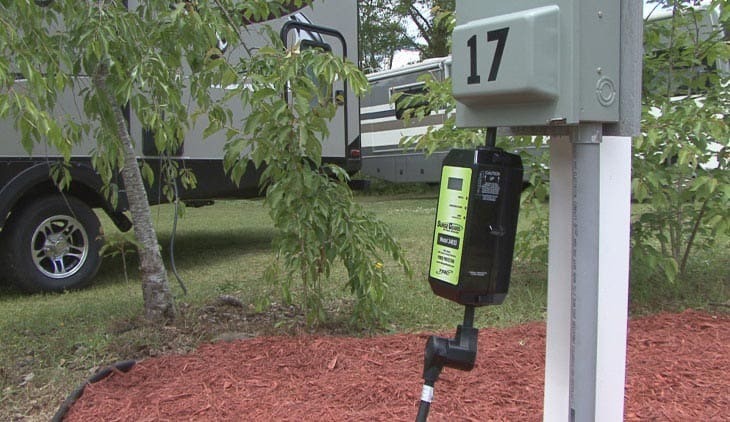 Overall, the 44750 is a good choice when it comes to quality and durable RV surge guards because it is built for the changing weather conditions and for detection of reverse polarity, open neutral and open ground. On a drawback, the product offers no low voltage protection. The manufacturer might want to take a look at this and improve the already great 44750. Camping aboard the RV is one of the most rewarding feelings in the world because it gives us the opportunity to spend time with our loved ones and be close to nature. However, in order to get the most out of our experience, we have to make sure that our rig is protected from power surges and faulty connections in the power shore. As we know, some camping grounds and RV parks do not have consistent and reliable power sources. So to help us attend to this problem, we need a good surge guard like the Surge Guard 35550, which is a hardwire model, from the brand. It is a decent choice for campers, travel trailers, mobile homes and pop-ups of 50A service. One thing I liked about the model is that it has an automatic reset function in the event of power restoration. It is one of the smartest features of the surge guard that continues to impress RV owners for its intelligent functions that make their lives easier. The automatic restore function also ensures that we don’t have to do it manually, giving us more freedom and convenience in operating the equipment. Another thing you will appreciate about the product is that it comes with multiple modes of surge protection that can ensure that it will work efficiently in providing full protection to our RV. It can protect RV from open ground, open neutral, reverse polarity and other important protection features. It is also designed and built to protect the air con compressor for its 128-second reset delay. This feature is one of the most important one to consider when buying a new surge guard. As you may already know, it is costly to spend on and install an RV air con compressor. With the surge protector, you can have peace of mind that it will be protected from power surges during power restoration. This protector can also save you money because it can provide ample protection to all your electronics and devices on the recreational vehicle. Some of these include microwave oven, TV, laptop, oven toaster, hair dryer, and so many more. By installing a good RV surge protector, you can have peace of mind that you don’t need to spend on costly repairs of your appliances and protect them from any damage that inconsistent power supply can give. 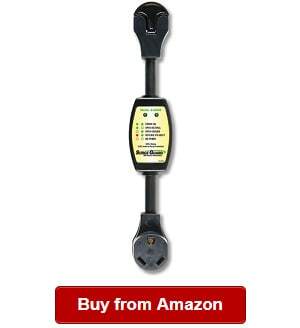 It is also one of the best when it comes to surge protection on the market for its 3850 joules power suppression rating. It is higher than those from other brands are in the same category. With it, you can be sure that it can handle demand power consumption in an RV. You can also have peace of mind that it will be able to work hard, consistently and efficiently in protecting your rig from a faulty power pedestal. It can even detect problems right within the first few seconds of plugging it. Another thing I would like to note is that the model is very easy to install. Using it quickly out of the box is possible with the easy to follow instructions, ensuring of a no hassle setup even for first time users of this kind of device. If you’re looking for a product that is easy to install and use, you should not miss this one on your list of surge guards to compare, choose from and install. On a drawback, this product is a bit larger than expected initially. When shopping around for a good power surge protector, you should not miss the Hughes Autoformer PWD30 on your list. 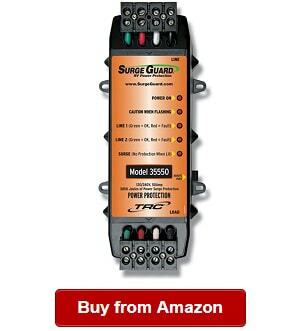 It is a powerful surge guard that can protect your rig from faulty park power supply. This brand is also one of the most trusted in the RV world because of its commitment to deliver high quality and durable RV products to last for many years. It is a 30AMP power surge guard that you can count on to protect your electronics, appliances and equipment from damage due to power surges. This surge guard offers up to 2400 joules of surge suppression rating. It is enough to handle the power needs in a recreational vehicle. One of the smartest features of the RV protector is that you can use it with Bluetooth technology, providing a wireless access to the metrics that you need to know. You can also make use of the android or iPhone app. These two features are not available in other surge guards that we’ve featured in today’s reviews. The smart features make the device more convenient to use because it allows for easy monitoring for the details and things that you need to know to ensure that the device is working properly and that potential issues are quickly notified to you. This model also has easy grip handles that make it more portable and easy to maneuver and move around. Also, it can offer a secured grip once it is installed in your rig. You will not also have a hard time to use it on any weather because it is made of weather resistant materials, which can deal with all types of weather. It also means that the surge guard can last longer because it is heavy-duty to use even if it is raining, snowing or windy. This product is also handy and lightweight at three pounds. This weight is lighter than other products in the same category are. It is an all-weather assembly product that can be used for all types of seasons. You can be sure that it will function well even in the harshest conditions. Overall, the surge protector is good for its heavy-duty features that can make it last longer than other products on the market can. On a negative note, the model is a bit bulky than expected. The Camco 55306 is one of the best choices when it comes to high quality and durable surge guards on the market because it is made of heavy-duty materials and components that can withstand the harsh outdoor elements and weather changes. With it, you can look forward to long-term use, giving you the most value out of your investment. If you’re looking to spend on a product that you can use for a longer time in your camper, mobile home or recreational vehicle, you should include the Camco 55306 on your list. 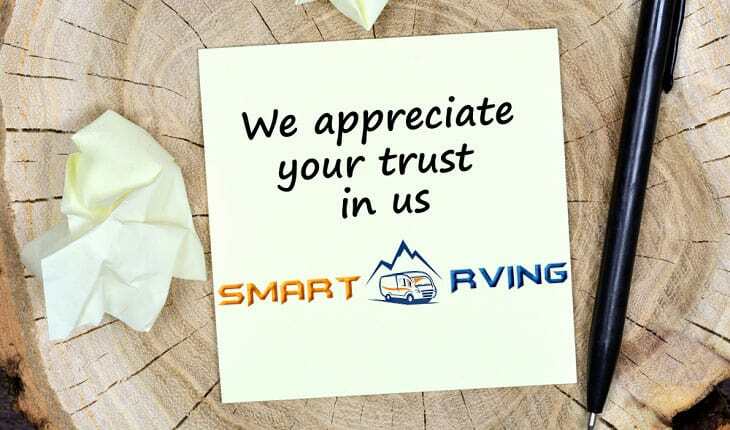 It is by a top brand that is known in the RVing world to be one of the most trusted makers of quality and durable RV gears, devices and equipment. One of the features I love about it is its included low and high voltage protection. It can protect the camper or mobile home from high voltage surge (>132 VAC) as well as from low voltage (<102 VAC), ensuring the protection of your appliances and devices from surges that will otherwise damage them. In the campground or RV park, there is not always a consistent power supply. Even if that is the case, you can have peace of mind that the surge guard can protect your valuable investment because it also includes an automatic disconnection feature in the event of power outages. In this case, you can be sure that your investment will be protected from any hazardous voltage. It also has an automatic reconnection feature that instantly reconnects once the power stabilizes. Another feature I liked about this model is that it has multiple protection modes. It can handle and inform of faulty connections including reverse polarity, open ground and open neutral. 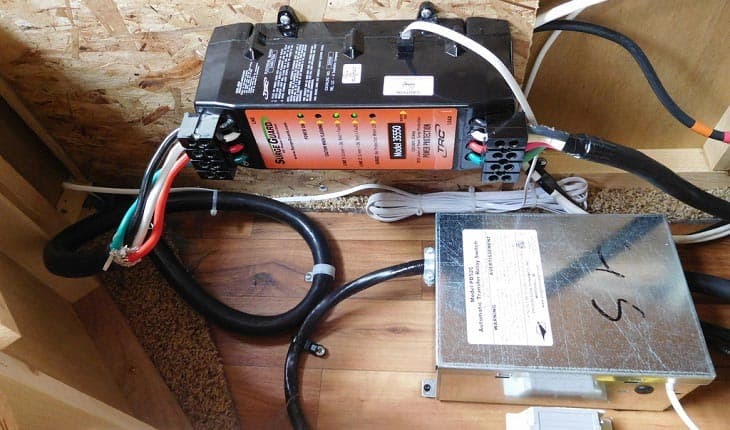 These are some of the best features that ensure the full protection of your RV from power surges that would otherwise harm the electronics and appliances in your recreational vehicle. It can also detect problems in the power pedestal, ensuring that you will be able to prevent any potential issues in the first seconds of plugging the device. 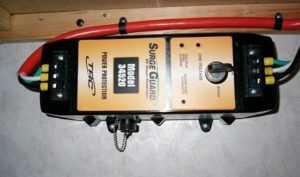 The surge guard is also one of the most powerful around for its high surge suppression rating of 3,850 joules, handling most of the power consumption demands in the recreational vehicle as well as ensuring that your valuable equipment and gears are protected from faulty connections in the RV camping ground. The surge guard for 50 amp service vehicles also has a great design. One of those is the diagnostic lights that can provide you with instant information of the issues that might cause your rig a problem. 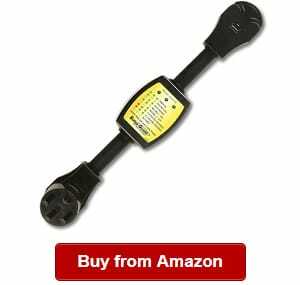 You can also rely on this product because it has diagnostic lights that will tell you about any faults visually without any hassles. Overall, the model is one of the most reliable products to buy if you’re looking for a good surge guard to protect your recreational vehicle and its electronics and appliances from damage due to inconsistent power supply coming from a power shore. On a negative note, this product is quite expensive. 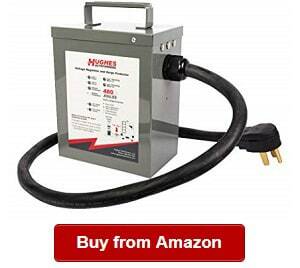 Just like the Progressive Industries 50 amp surge protector, the Hughes Performance RV22050 Autoformer is one of the most reliable picks on this list. You should not leave it when trying to compare different power surge protectors on the market. It is from a top brand that ensures the high quality and durability, ensuring that you can use it for the many years to come. The product is made of heavy-duty components that can also deal with the changing outdoor conditions and weather changes. You can use it in the rain, sun, wind and snow, so no matter your region, you can rely on the device for its continued performance that you might not be able to find in other products on the market. The product also has a 12,000W capacity that can handle most of the power consumption requirements in the recreational vehicle. You can have peace of mind that the surge guard can provide multiple types of protection that your camper or mobile home needs. The mobile home surge guard is one impressive product to trust. One thing that can make you take a second look at it is its automatic boost of up to 10% when needed. 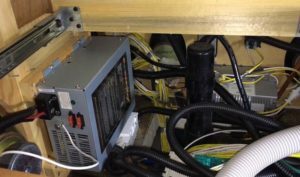 You can rely on the surge guard that is also able to provide an accurate diagnostic of the power condition in the camping ground or RV camping park. Using it, you can be sure that your electronics and appliances won’t be damaged. It also has light indicators that can easily show details of any errors in the power source. Using it, you can prevent big problems before they arise. With it, you can also avoid spending on repairs of damaged appliances and devices in your recreational vehicle. For each line, it has boost indicator lights that make it even more efficient than other models on the market are. Choosing it, you can be certain of continued and accurate monitoring of the power source status. This model combines both surge and spike protection, making it an effective and accurate surge guard that can make sure that your rig will be protected all the time. When it comes to quality, there is nothing to beat one that is UL listed and certified. This product is guaranteed to possess quality for passing authority standards in determining the best and safest products to use for your recreational vehicle. This product weighs heavy though at 35 lbs, though. But with all its great features, you can be certain that you are choosing an excellent power surge protector for your camper, mobile home or pop-up. The RV22050 is also made in the USA, ensuring of its high quality and original components and top standards. However, it is quite heavier than other surge protectors on the market are. 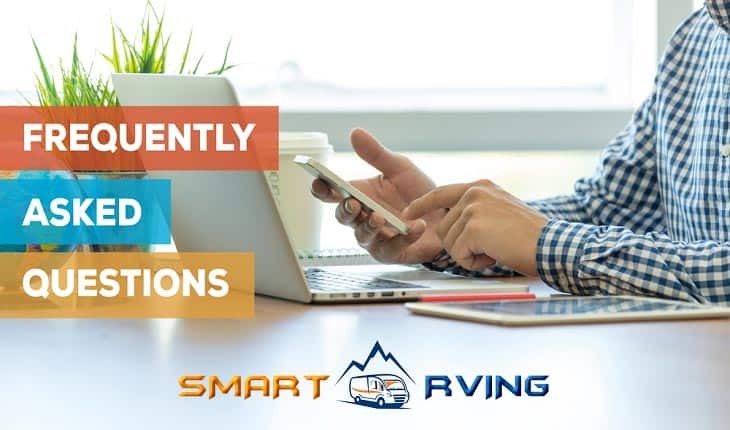 Smart RVing is your one-stop solution when looking for the best RV gears, devices and equipment. We have years of experience in RVing and using different products for it. Our team is composed of seasoned RVers that have the passion to share our knowledge with you about finding the right RV surge protector, such as the Progressive Industries EMS-HW30c. By trusting us, you can have peace of mind that we’re offering unbiased reviews and thorough shopping guides to help you pick the right product for your RV. Hope we could help you pick the best surge guard for your RV in today’s reviews and buying guide. The recreational vehicle surge protector, such as the Progressive EMS-PT50x, is one of the most useful devices to use in your RV. It is used in protecting your rig and its electrical and electronic components from any damage due to voltage fluctuation. For example, some of them can protect your RV from low and high voltage. 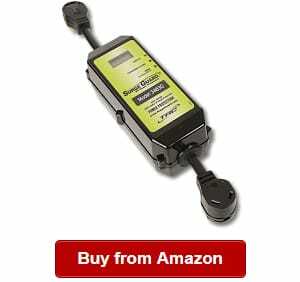 They can also prevent damage in your RV by detecting reverse polarity, open ground or open neutral. It is a valuable device in regulating the voltage supply to any electrical device. The surge protector does it by blocking or shorting the voltage supply to your device from an electric power coming from an above safe threshold. Surge protectors, such as the EMS-HW50C, can protect your rig and its electronics and electrical components from power fluctuations. 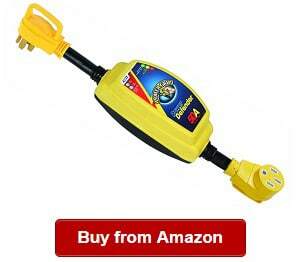 It is used by plugging into a power pedestal found in the campground or RV site. They are available in two options – the 50amp and the 30amp kits. Some of the things it checks to ensure your rig’s protection include reverse polarity, open ground and open neutral. It can also check for and detect for proper voltage, frequency, grounding and so many other factors to ensure that your rig and its electrical/electronic components are protected from power surges and errors. Nevertheless, it can work by monitoring the condition of the power source and informs you of any potential issues before they become a problem. It can also cut power when needed. Also, some of them have the automatic restoration feature that you can rely on, making the surge protector an even more convenient and powerful product to use in your recreational vehicle to ensure that your expensive electronics and appliances are protected from surges. Some that the protector can guard against power fluctuations include AC units, refrigerators and television. 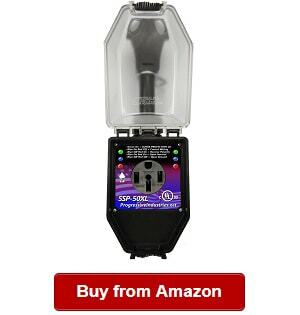 There are certain types of surge guards to know when shopping around for one to make the best decision when buying one as you can read in EMS-PT50X reviews, for instance. In the following, let’s discuss the types of RV surge guards to choose from and install in your rig. The portable type is one of them. It is the more chosen option for many RVers because it is versatile to install from one recreational vehicle to another. You will also not have a hard time to install and use it because many of them are plug and play models. Just make sure that you are choosing the correct amp rating – 30 or 50, according to your service vehicle requirements. You can easily use this type. Just hook it up into the power pedestal directly before plugging it into your camper, mobile home or recreational vehicle. With the portable type, you don’t have to wire it into your vehicle. All you need to do is to hook it up on the power source before plugging it into your rig. It is also one of the reasons it is the more commonly selected surge guard versus other types. And in the event of issues, you can also replace the portable power surge protector without any hassles. It is the opposite of the portable type because you have to wire it in your vehicle. The surge guard is also good to use because it is also dependable and is made of durable components. You can also mount it in your recreational vehicle easily, but of course, it is still quicker to use a portable unit than this one. You can find many of them installed close to the power wheel. What are the benefits of choosing the hard-wired versus the portable model? Using it, you don’t have to mind about hooking anything. This type is also concealed from view, which is why it is chosen by RV owners that don’t want to get their surge guard stolen. You don’t also need to worry about dragging it on the floor because it is internal especially in the rainy weather or wet conditions. 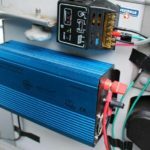 The next question when trying to decide whether to use the RV surge protector or not is, ‘what are its benefits?’ For one, it can make sure that the electronics and electrical components in your recreational vehicle are protected from power fluctuations, which are some of the problems in RV parks and campsites. Using one, you can have peace of mind that issues, such as reverse polarity, open neutral and open ground are detected in real time. With such benefit, you can be sure that you can detect any potential issues before they even cause damage to your rig. You can also be certain that many of them have automatic features. When they detect errors, they can turn off power immediately to protect your appliances and equipment from low or high voltage that will otherwise damage them and cost you much money. 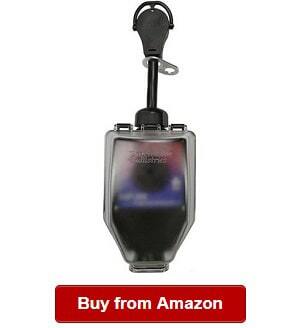 Nevertheless, it is worth investing on this device if you want to protect your valuable investment from damage. You should definitely have it on your vehicle for its total protection. There are certain factors to consider when shopping around for a good surge guard and reading reviews like EMS-PT30X reviews, so that you can decide on which the right one to buy is for your mobile home or recreational vehicle. In the following, we’ve prepared a buying guide along with the factors to consider when buying this device. It is one of the main factors to check when buying this device for your recreational vehicle. It can mean the level of surge suppression or protection that the device can offer to your rig. Another thing is that the protector must also be able to disperse heat during power spikes. You should check on this factor if you’re looking to buy a surge guard that can last longer and provide better protection for your rig. Look for one with a higher rating so that you can also be sure that it can prevent overheating. You should also find a model that is UL certified. It is one of the authorities that ensure that consumers can buy a safe and quality product to protect the RV from power surges. Such certification can also give you peace of mind that you are buying a quality and durable product to last longer. 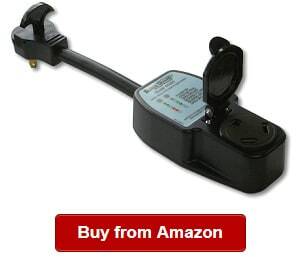 You can also be sure that the product can protect your RV appliances where you are plugging them. You must know that one device requires some electricity amount so that it can deliver its functions. If not, the device will not run or function correctly if insufficient power is present. When this happens, your device might risk failing to perform its function. Nevertheless, check for the amp rating when buying a surge protector on the market. This factor is one of the most important to consider to be sure that you are buying the right surge protector for your vehicle. You should avoid picking a product that will give you a hard time in installation. You should check that it comes with manual with illustrations to ensure that you are guided when installing the surge guard to your vehicle. It is essential to pick an easy to install surge guard especially if it is your first time to install and use this product. As much as possible, you should also look for a product that has a plug and play design, ensuring it is not hard to install and operate. You should also look for one that is not easy to move around so that you won’t have a hard time in taking it from one place to another. It should be compact and lightweight yet made of sturdy materials to deal with tough outdoor and weather conditions. Especially if you have to transport your unit regularly, you must find one that isn’t heavy. Otherwise, it will put on too much weight on your vehicle. It is one of the best features to look for when buying a surge guard. You must pick a product that has an easy to read display to show you the metrics of the things you need to know, including voltage, frequency and so many more. In addition, you must find one that is easy to understand. Finally, you should pick a surge guard which display is bright enough at nighttime or daytime. It is another important factor to consider when shopping around for a good surge guard. Just like when shopping other appliances, gears or devices for your recreational vehicle, you should look for a product that you could afford. It is also the reason that we have reviewed protectors coming from different price ranges. Q: Is RV surge protector necessary? A: Yes, it is. In fact, the surge guard or the surge protector is one of the most important investments to make in your recreational vehicle because it can protect your rig from faulty power source in the RV camping park or campsite, which is a common concern among RVers. Using an RV surge protector, you can have peace of mind that you can protect your appliances and devices from power surges. Some of them also have 128-second delay, which is useful for the AC compressor. Also, the best of them can ensure that they can check for open neutral, open ground, reverse polarity, low voltage and high voltage. Q: What are good RV surge protector brands? A: There are many good brands to rely on, and some of them include Progressive Industries, Technology Research, Hughes Autoformer and Camco. They are some of the most trusted brands in surge protecting devices on the market. They have the features and functions that you can depend on when it comes to efficiency and accuracy. Many of them also feature LED indicator display that can inform you of the most important details that you need to know before any issues arise. These brands are also committed to offering quality and durable surge protectors because they are made of weatherproof materials to deal with changing weather conditions, including snow, wind, sun and rain. You can also rely on their products that can ensure of easy installation on your recreational vehicle because they have solid and compact design. They are also portable and can provide an easy maneuvering because they feature solid pull handles that can make plugging very easy. Many of them also have locking brackets that make it easy for users to transfer them from one RV to another versus hard-wired models. A: There is no definite answer to this question because waterproof feature varies from one brand to another and from model to model. That is why it is important to compare your options before buying a surge guard. The great thing is that many of the latest models now have waterproof ability, making them suitable for use in any weather conditions. These surge-protecting devices are now made of weatherproof materials, meaning they can also withstand other weather changes. For this reason, it can be safe to say that many models and brands now are making their surge guards more suitable for use on any weather. It also means that they are more durable than older models are. So when choosing a surge protector to buy, you must also look for their weatherproofing ability to ensure that they can deal with harsh outdoor elements without being damaged easily. Q: Where are they made? Where to buy? A: Many of the surge guards that we have featured today are made in the USA. They are UL listed and certified for safe use. The models we have reviewed today are those top rated products in the Northern American region. 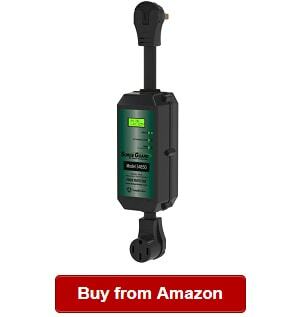 If you’re asking where to buy the best surge protectors, you might want to look at Amazon where the widest range of surge guards can be found. They are available in different types and configurations. They offer protectors for 30 amp and 50 amp service vehicles. Some of them are portable and others are hard-wired. So if you want to choose from the widest selection of RV surge guards, you might not want to look any further but buy from Amazon. There are also other places online to buy, and you can also check them out. Nevertheless, you must be able to compare and study your options well when shopping around to pick the right one for your vehicle based on its requirements and specifications that you’re looking. Q: Electrical management system (EMS) or surge protector? A: There is no definite answer to this question. It all lies on your personal preference on what to choose based on your needs and situation. You can begin selecting the best surge guards from one of the products we have featured above because you can easily compare these top rated products to choose between a surge protector or an EMS. 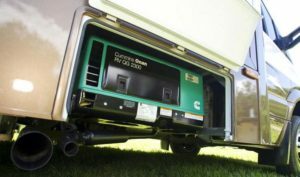 Q: How to use an EMS with an RV inverter generator? A: The EMS is ideal to use if you’re RV is using an inverter generator. Know that these generators commonly installed on the recreational vehicle possess floating neutrals. It only means that the EMS will be able to spot or detect it being an open ground. This also means that it won’t be letting power to flow into your vehicle. Q: 50-amp vs 30 amp RV surge protector: What’s the best for you? A: The answer lies on the type of service you’re using. You should be using a 30-amp model for a 30-amp model RV. The same goes if you’re using a 50-amp service. In this case, you should be using a 50-amp power surge protector. You can begin comparing and choosing from one of the products that we have featured above for the best results. Nevertheless, you must pick the right product that is suitable for the service vehicle you’re using. A: There is no specific answer to this question because it varies from one brand to another and from model to model. You must look for a product that is covered by a good warranty. Some of them can be between three and five years. On the other hand, there are products covered by a lifetime warranty, and that can also cover the parts and labor. Some can even cover the internal electronics and materials, including those found inside the housing of the product. Q: How to install RV surge protector? A: Installing the RV surge guard is not hard at all. Just read and follow the instructions and diagram included in your purchase. When you buy from one of the surge guards that we have featured in the above, you can be sure that they are not hard to install. You can also get help from their technical support that they provide to their customers. In all cases, you can have peace of mind that the best RV surge guards on the market are easy to install in your recreational vehicle. You won’t even need outside help to make it operational in your vehicle. Q: How to secure RV surge protector? A: It is easy to secure the product on your recreational vehicle because many of them have locking brackets to keep them in place and secured in your RV. Some types have a different type of locking mechanism, but you can be sure that they are all durable and easy to install on your RV and secure them in place. Q: How to use RV surge protector? A: The RV surge protector is very easy to use. This device is used in detecting and monitoring faulty park power source. Based on model-to-model or brand to brand, they might have other instructions on how to use their products. In most cases, they are easy to use. If you need more help, you might want to get in touch with their technical support team for assistance. There you have our guide on the best RV surge protector. We do hope you picked valuable information from the shopping guide we’ve highlighted above as well as the top-rated products we’ve featured. From these reviews, you can start comparing and weighing your options to find the right surge guard today! 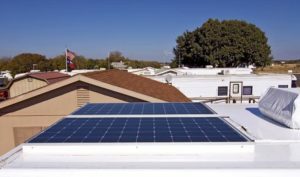 If you’re looking for other products in RV power and electrical supplies, then we suggest going for these articles: best RV generators, best RV converters, best RV inverters, best RV solar panels and best RV batteries. We do hope you find them useful. Thanks!